The small Scarlet Snakes of the northeastern United States are extremely pretty animals with their red blotches bordered with black on a cream background. From 8 to 24 inches long, they are subterranean, egg- laying animals that feed mostly on small vertebrates. 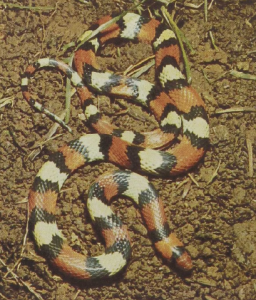 Some people have commented on the resemblance of this snake to the poisonous coral snake with the suggestion that it may derive some protection by imitating the color pattern of the poisonous snake. However, their ranges overlap only slightly. During certain seasons of the year the Scarlet Snake adapts to an unusual food source—the eggs of turtles. Scarlet Snakes can sniff out turtle nests and dig their way into them; if the eggs are still fresh they use the posterior, scimitar-like tooth of the upper jaw to rip a slit. They then immerse their head into the egg and drink the liquid.